You’ve got a reason to smile. Brushing daily with this fluoride free toothpaste helps cleanse, brighten and prevent plaque and tartar build up on teeth for close up confidence. Flavoured with mint and spearmint, our formula contains antioxidants from white tea, ginger, grape, pomegranate and cranberry extracts. Formulated without artificial colours and sweetened with the natural ingredient xylitol. 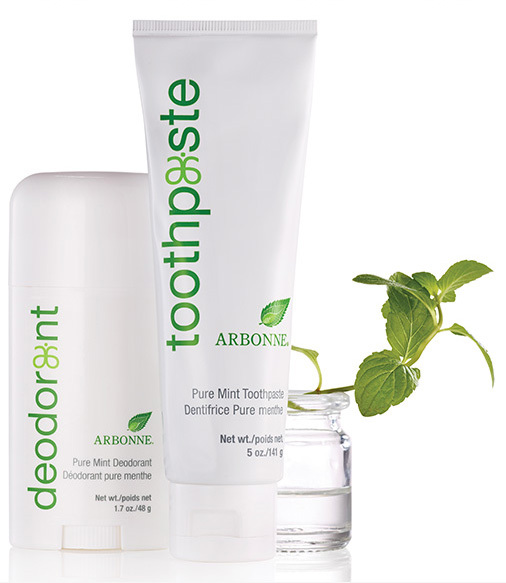 Stay cool and collected with our aluminum free, paraben free deodorant infused with spearmint, mint and antioxidants from white tea, lemongrass, sage and tea tree extracts. The unique odour fighting formula with baking soda and vegetable enzymes helps you feel fresh all day. Baking soda helps preserve freshness and absorb odours. A vegetable enzyme helps neutralise and block the effects of odour causing bacteria to deliver gentle, effective protection. Antioxidants from extracts of white tea, ginger, aloe, lemongrass, sage and tea tree fight odour. Fresh smelling botanicals lemongrass and sage contribute to fighting odour causing bacteria. Moisturising aloe and witch hazel help soften and soothe skin. The health impact of using artificial sweeteners and flavours is not well understood, but there is some concern regarding their use, so Arbonne avoids them completely. Pure Mint Toothpaste uses only the natural sweetener xylitol and natural extracts of mint and spearmint to produce a refreshing, minty flavour.